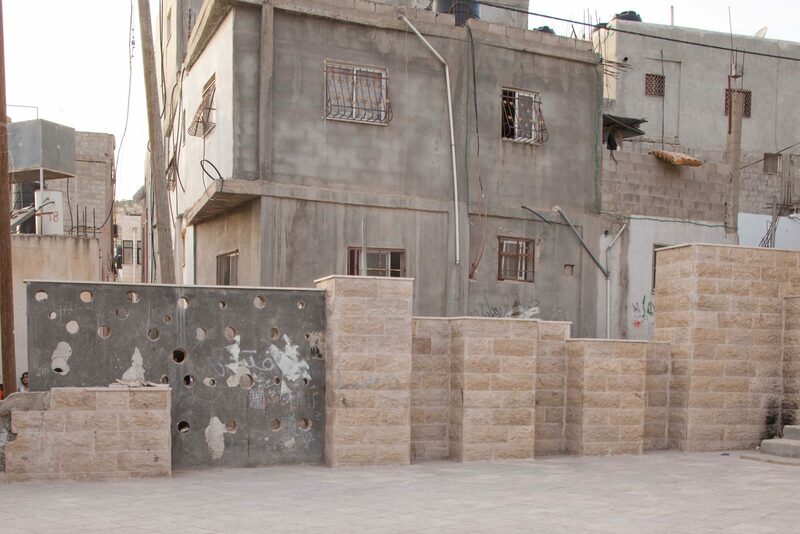 This was the challenge posed by the inhabitants of Al-Fawwar refugee camp to the UNRWA Camp Improvement Programme. I was directing the team of architects during the period of the design and the building of a plaza in one of the camp neighborhoods in 2009. Throughout the participatory design process, the most emphatic requests came from several women who suggested the camp needed more safe spaces between houses for kids to play “under the eyes of their mothers.” The few available recreational spaces on the outskirts of the camp are mainly used by older teenage boys. These spaces, usually enclosed by walls, locked at night and protected by a guard are the only image the camp inhabitants have of anything resembling public open space. What do you call the refugee camp? Now you see houses, but early on the camp consisted of a group of tents. Then after we had built huts, they allowed us to put roofs over them. 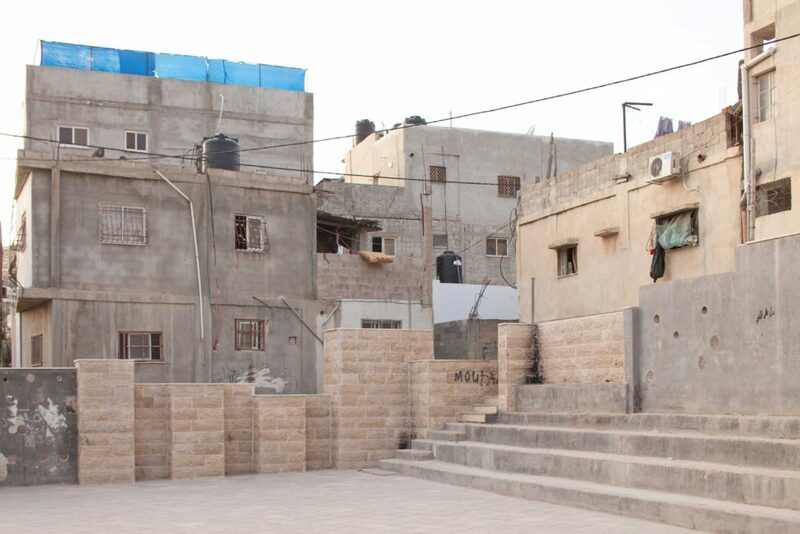 It was said that if we put actual roofs on our houses we’d forget Palestine, so we just put up zinc sheets. Do you know what zinc sheets do to you under the Beirut sun? Now, more than 60 years later, I am sitting with our team of architects and a concerned group of refugees questioning what building a plaza in a refugee camp might represent. Among them are Abu Rabih and Abu Rami, considered among the founders of Al-Fawwar refugee camp. 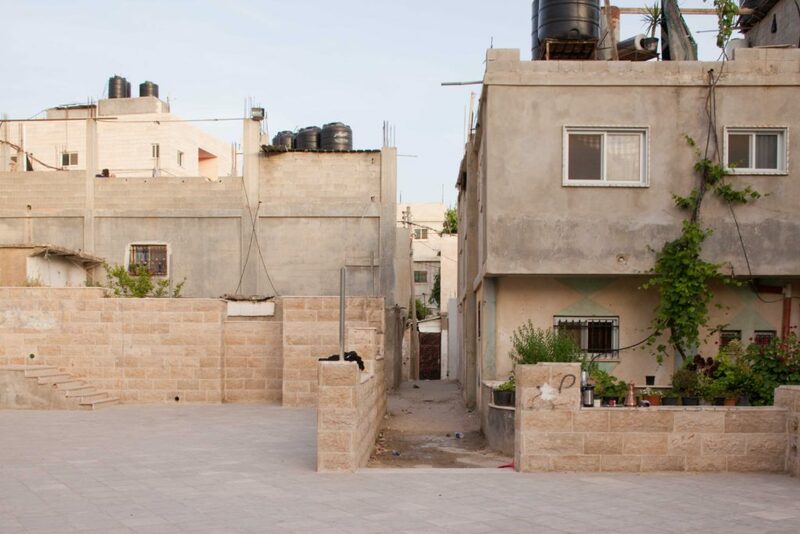 They witnessed the tents being replaced with masonry homes and now they are observing their neighbors beginning to acknowledge the spaces between the houses as well. Surely Abu Rami is remembering how difficult the decision was to build concrete walls instead of maintaining the tents. Would this move cause the world to forget that what they really wanted was to return home to their villages rather than settle permanently in the camps? Would a plaza be another concession — another way of accepting the permanency of the camp? Is this merely a wretched attempt to mitigate the conditions of total subjugation? Or is the plaza the physical indication that the refugees have abandoned their strategy of convincing the whole world of their personal misery through the architectural misery of camps; that they are instead initiating a new strategy of capitalizing on their strengths as refugees rather than their weakness as victims? 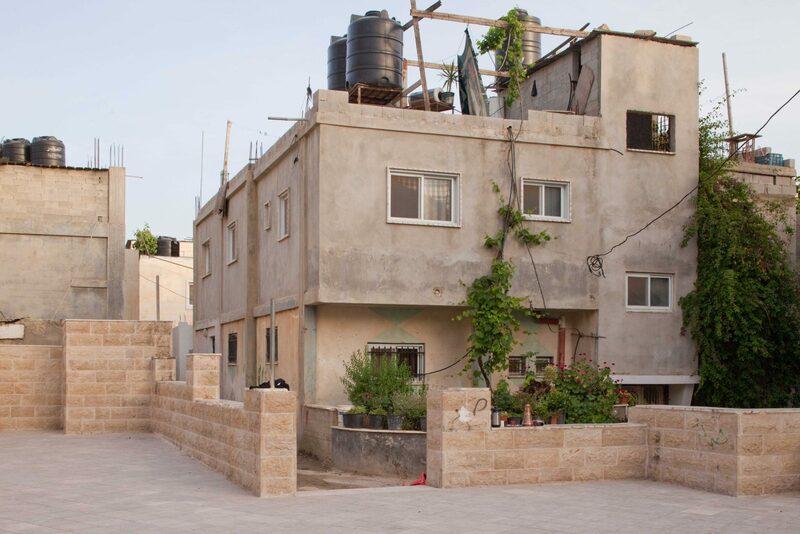 Abu Rami’s father had been among the main opponents of building more durable homes. No doubt he remembers his father telling him, “Once you begin to enjoy your life in the camp, you will forget the land you came from.” Is it historically acceptable to think about the “public space” of a temporary camp? What is defined as “private” in the camp is not really private, because the homes are not registered as private property, and what is defined as “public” is not really public because neither the host government nor the residents themselves recognize it as such. Thus, how does one define “private” and “public” in a camp anyway? The plaza not only brought questions about normalization but also about the political reality of camps. If there is no private property and no authority that advocates for public space, then who would be responsible for its maintenance? Who would decide how it can be used and who can use it? Would women be allowed to gather in this space even though they had requested initially for their kids? Finally as the discussion was geared towards how this space might look, the community decided that the plaza would be enclosed by walls. Many of them were convinced that the plaza would never work without doors, locks, and a guard. The neighbors were emphatic in that they did not want the facades of their houses to be what contained the plaza as they felt they would lose privacy and that by enclosing this space whoever wanted to be inside it had to deliberately enter it and, therefore, would feel more responsibility in respecting and taking care of it. And there it was, a plaza enclosed by four walls. Suddenly I was reminded of that very first moment in the history of the camp when refugees replaced the tents with a roofless house. It was a good compromise: the plaza was open and always accessible but enclosed and not entirely public nor private. No locked doors, no guards. It was built and it quickly became an ideal place for weddings, funerals, and kids could run around with their balls without disturbing the neighbors. The skeptics soon began to understand the purpose of the space. In 2011, I met Ayat, a young woman from the camp whom I had met initially during the selection process of participants for Campus in Camps, an experimental educational program. Meanwhile, the plaza was almost in its final stages of construction. Al-Fawwar Refugee Camp is not like other camps. It is located on the southern tip of the West Bank, a few kilometers from Hebron. As constant clashes occur between Israeli settlers and Palestinians around the main road that leads to the camp, it is isolated from the rest of the territory and its community is amongst the most conservative. However after years of working in this camp it always manages to surprise me. And this same camp where it is socially forbidden for women to be drinking coffee in the plaza in front of their houses is also where we encountered some of the strongest female candidates for Campus in Camps. Ayat is in her mid-twenties. She is open to challenges and convinced of her rights as an individual and the possibilities of changing her society. Throughout the interview she highlighted the importance of being an active member of her camp community. For six years I had struggled to involve the women of the camp to participate in the design of the plaza, and the few women I managed to engage were over forty, married, and with children. In such conservative places, like Al-Fawwar, the unmarried woman is treated like a treasure to be preserved and kept away from the eyes of everyone until she is married. Thus, many women see marriage as a way of escaping their family and obtaining some measure of freedom. As I would later discover, this was not the case for Ayat. When I asked her if she had visited the plaza and what she thought about it, I was not surprised to hear that she had yet to set foot inside of it and never had the opportunity to be part of the various meetings that took place around its design. I immediately felt that Ayat was exactly what the plaza needed and, in some way, maybe the plaza would be exactly what she needed. I smiled at the idea that this might be like a traditional marriage: between a woman and a space. After several discussions about the plaza we decided to hire a bus and visit this space with all of the fifteen participants of Campus in Camps. We arrived at the camp during the early winter of 2012, after a long ride full of enthusiastic young men and women blasting music from the bus speakers. Fifty-five days had passed since the beginning of the strike from UNRWA employees demanding better employment conditions. It’s a common event, and, as UNRWA is responsible for garbage collection, a strike quickly results in mountains of garbage piled up on the camp streets. As we made our way through the narrow alleys, stepping over piles of trash, we finally arrived at the plaza. To my relief, the plaza, unlike the rest of the camp, was not littered with garbage. We all sat on the plaza stairs under the warm winter sun. The feeling of relief, however, quickly turned to distress, as I glanced at one of the walls we had perforated with small openings as a way to create permeability between the street and the plaza. 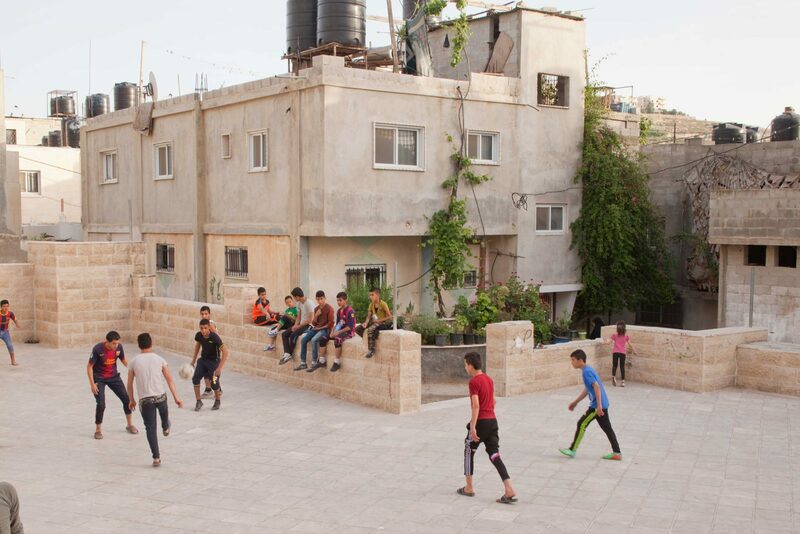 The holes had been covered with cement and an adjacent smaller wall had been covered with oil in order to prevent teenagers from sitting on it. The space was absolutely vandalized! While I was lost in my thoughts about the role of architecture in a place like Al-Fawwar, I was interrupted by one of the participants of Campus in Camps who gasped: The plaza is much smaller than I imagined. The image on the website is of a much nicer and much bigger space! The plaza was bursting with eager kids who had swarmed around us. There were so many we had a hard time hearing each other as we were drinking coffee brought to us by one of the neighbors. One of the kids replied offended: But this plaza was much smaller before. Exactly here in the place where we are sitting were my uncle´s two very old UNRWA shelters that were demolished in order to enlarge the plaza. While you have imagined it much bigger, I remember it much smaller. I jumped at the opportunity and asked him: If you are so happy to have this big plaza then why do you destroy it? Why aren´t you taking care of it? This question had haunted me ever since the first moment I began to work in public spaces in places with a long history of colonialism and marginalization. As Ayat would later put it, People have no culture of belonging to what is outside of their houses. But I also believe that when the relation between people and the authorities is so tense, as it is in camps, then the public space is the first victim of such tension. That day we spent hours in the plaza discussing the dilemma of the lack of belonging and appropriation of public space. Months later, after having done several activities in the plaza, Ayat complained about how she didn’t understand why kids after having planted trees and flowers as part of an activity held in the plaza, would immediately vandalize them. Is it the way they are raised? Is it the school? Why do they behave differently inside their homes? Is it because the camp is a constant reminder of not belonging? That the public realm is dominated by the reality of oppression and colonialism? Consequently, that the public realm, in this sense, is the enemy itself? Ayat is fiercely trying to defend her rights and her freedom from within the social framework of the camp. She is not trying to detach herself from her community; she does not refuse the camp that is not giving her the freedom she seeks; she is not escaping herself or the place where she lives; instead she is trying to create a new space that challenges stereotypes through making activities that will eventually make it normal for women to be seen outside of the walls of their homes. Ayat believes in a woman’s right to be free beyond the confinement of the private home. However, I continued to be confused by why Ayat had not recruited other young women to join her revolution. When I asked Ayat why the women in the group were all older than her she answered: “Firstly, I feel I learn from them and they learn from me as knowledge is not conditioned by time or space or a degree. Secondly, I feel older than my age and I relate better with people older than me. And lastly, maybe most important reason has to do with my mother´s refusal to leave the camp. My mother suffered from what the camp people call an “illness of not being able to sit in the car.” Each time she would step inside a car she would begin to shout, hurt the driver and herself, and would even go so far as to destroy the car. Many doctors tried to intervene by giving her several types of drugs but it never worked. I have no idea if my mother was afraid that if she would leave the camp she would never find it again as it happened to her mother with her home during the Nakba. By having this “illness” she decided to guard the camp and never leave it. The very few times she had to go to the doctor in the nearby city, we would wake up very early and would walk for two hours to reach the doctor. All the camp would know that day that my mother would be walking and not guarding the camp. I remember my sister’s wedding was in the city of Doha, a four-hour walk from Al-Fawwar. And since it was so difficult for my mother to leave, I was the one normally replacing her in social occasions outside of the camp. My mother´s “illness” forced me to be responsible and mature at a very early age as I had to accompany my father everywhere. Ayat was born in the camp. She is now part of the third generation of women refugees living in Al-Fawwar and she is trying to redefine what being a refugee means to her. Ayat’s mother is afraid to leave the camp as she feels she will again lose her home. In a way, her right of return is secured only if she is in the camp guarding it. However, for Ayat her right of return is a more abstract idea. It is not linked to a physical space she has to protect. It consists in her right as a woman to be an active political subject: she refuses to be a victim. Most of the time, the struggle for liberation for the people under colonialism keeps them from dealing with important basic rights. Human rights are subsumed by one gargantuan struggle: the end of occupation. In this case, the plaza becomes a key protagonist in Ayat’s struggle to define resistance to this place: the plaza as a place from within the community to begin to imagine their own future. The process of decolonization begins with negotiations, discussions, and inevitably contradictions within their community. I worked with Ayat for more than two years and I never had the chance to meet her parents. Ayat has been able to fill the plaza with women of the age of her mother but she has never managed to convince her to join them. In June 2015, together with some colleagues, we visited Ayat and her group for some tea and biscuits in the plaza. It was evening and everyone was in good spirits as we chatted in the summer breeze while the kids where playing around us. The time for prayer arrived, and the women wanted to go back home, but one of them said, Why don´t we pray in the plaza? Despite skeptical looks, she began praying and another woman joined her, while the rest of us continued chatting, laughing, and discussing until they were finished. As night came, lights were switched on and it felt as if a bell had rung reminding us it was time for the men and young teenagers to get some fresh air outside of their homes too. As I was saying goodbye to everyone, Ayat proposed we go to her Aunt’s house to continue the evening together. We arrived at the house and found ourselves in a beautiful green garden with an olive tree planted in the middle surrounded by mint, basil, rosemary, and oregano. We were invited to the salon for guests, but I insisted we sit outside in the garden. We sat under the tree in the dark as Ayat’s aunt sat next to the door of the house she kept open, giving way to some light coming from inside. Later on, Ayat’s mother arrived and immediately asked why we were sitting under the tree and not in the salon. We all reassured her that we had requested it as we wanted to be outdoors. Her voice was identical to Ayat and we kissed each other, both feeling that we should have met a long time before. Ayat interrupted and with excitement announced that they were all celebrating that her mother had finally been liberated from her illness. Her mother began to tell us the story. I didn’t know if I should believe this story or not. It was so fantastic it seemed as though she had invented it as a metaphor of the sixty-eight years of exile in the camp. As she described the journey, it brought me back to the image of Palestinian refugees preferring to live under the heat of the zinc roofs in the hot Beirut summer rather than accepting a more comfortable life under concrete roofs. To be uncomfortable and unsettled is a form of struggle, a reminder of refugee status. As time went by, the camp was turning into the only legitimate witness of a refugee’s loss. Preserving the image of the unsettled roofless camp was a way of preserving their history and their right to return home. Ayat’s mother never wanted to leave the camp because she was so afraid that if she did not guard this space she might lose its existence; subsequently, she thought, she would lose her grandfather´s house as well. The house she had always longed for in her dreams and through her father and grandfather´s stories is protected only if the camp is still there to witness the loss and to continue reminding the world of the right of return of Palestinian refugees. As the entire camp came to witness her getting out of the car, they wondered: was Ayat’s mother publicly giving up her responsibility of guarding the camp? Of course, she is still shouting inside to show that she is suffering but she also accepted that she, like others, will leave the camp behind. At some point, I realized that Ayat’s mother perhaps embodies the camp. It goes to follow then that Ayat is the plaza. The camp condition is the condition that lives inside Ayat’s mother. In order to protect her family and home, she refuses to be on wheels and has accepted the camp as her prison in order to protect the notion of “home” from disappearing. As we are sitting in the garden, Ayat’s sister tells me that she won a scholarship for a Master’s degree program in Berlin. I look at her puzzled. I know that she will not be allowed to go on her own. Almost as if she is guessing my thoughts, she adds that her father will accompany her. Almost shouting, I ask: What will your father do for two entire years in Berlin? Ayat’s mother replies: He will find a mosque where he will pass his days. Ayat adds: He wants to go; he would love to accompany her. This is what she wants and he is willing to do anything to please her. Ayat’s mother groans: The other solution is that she finds a husband and takes him with her. Many young men have asked for her hand in marriage, from the worker to the doctor, and she has never paid them any attention. She continued: I mainly would like to see both my daughters marry. Each one of them could take her husband wherever she would like to go. If they had yet to receive any marriage requests I would accept it as God´s will but what I cannot accept is that they are rejecting them all. I don’t think that they don´t not like any of them but I believe they are against the idea of marriage as such. They want their life as it is. One of the women from Ayat’s group added: Marriage is a very good thing as religion tells us. It is not right that you refuse marriage. Ayat quickly replied: This has nothing to do with religion. I still have work to do. I still have many things I would love to achieve in my life. If I encounter a person to marry then he is welcome in my life; if not, I am not concerned. For now I’m happy, I’m not interested in a man that will come and control my life. Leave me alone. Ayat’s mother is disappointed: Did you hear? This is the main reason she refuses marriage. She is not even open to the possibility. Ayat pauses and tries to explain: It’s not because I’m snobbish; all I’m longing for is a person that understands who I am inside and outside. I’m happy and free in the house of my father. Why should I get involved with someone? I was moved. From the outside one might perceive Ayat’s freedom as meaningless. She is a young woman who cannot travel unaccompanied, who has to constantly negotiate her actions outside her home, who has to rush home at sundown. However, Ayat feels she has agency over her own life to change it and to help change that of others around her. This is the freedom that Ayat is trying to defend and she is not willing to compromise any of it by getting married. However, this contradicts the unspoken rules of her society. The reason, in the end, that many of the women in her group are older is because younger unmarried women are not willing to compromise the social image they are trying to preserve. No revolution before marriage. First we get married, then we change. Otherwise we risk our chances of finding a proper husband. The beautiful thing is that Ayat’s bravery is supported by her family. Her father is also trying to find ways within the framework of religion and society that would permit Ayat the maximum freedom of a woman her age in Al-Fawwar. She understands this better than anyone else and as with all the limits she has she is convinced that her father is a believer in her freedom project and finally she fears she will never find another man to be her ally. One of the ladies in the group says: But your father and mother will not live forever. Ayat asserts: I have God and myself. I hope God will give my parents a long life and eventually my sister, my aunt, and me will be a fantastic group together. We will take care of each other. Ayat’s mother shakes her head: This is what she will tell anyone who comes to ask her hand in marriage: that she is not in need of a husband. She is looking for a partner, and when they tell her that her husband will be her shelter, he will protect her, she furiously answers that she is not looking for any shelter; she feels sheltered enough and has no need for a man to do so. Ayat: I absolutely hate the language they use. Ayat’s mother looked at me for help. She asked if I felt it was appropriate for Ayat to be speaking this way. I felt trapped. I like Ayat’s mother very much and I wanted to please her, but what Ayat is doing is what I have always hoped to see happening in Al-Fawwar. I asked her to forgive me. Unfortunately I cannot be on your side this time, I said. As much as I would like this to be a story about how the plaza improved life inside the camp and how Ayat managed to transform women’s rights in Al-Fawwar, the truth is that both the plaza and Ayat’s revolution are vulnerable experiments. As much as Ayat seems to be a strong revolutionary and visionary, she has also placed herself in a position in which she is extremely fragile. The same applies to the plaza. Its strong presence within the camp is what makes it vulnerable: it challenges the very meaning of the camp. Khoury, Elias, Gate of the Sun (Bab al-Shams), trans. Humphrey Davies. (New York: Picador, 2006), 236. Excerpt from Sandi Hilal, “A Plaza in a Camp: A Play in Four Acts,” in ed. Esther Choi and Marrikka Trotter, Architecture is All Over, (Barcelona: ACTAR, 2015). One of the most important Egyptian newspapers. Campus in Camps is based in Dheisheh refugee camp in Bethlehem, Palestine, that I co-founded with Alessandro Petti in 2012. It is a space for communal learning and production of knowledge grounded in lived experience and connected to communities. It engages young participants in a two-year program dealing with new forms of visual and cultural representations of refugee camps after more than sixty years of displacement. The group of participants in the program was selected after a three-month period of interviews, consultations with the community and publicannouncements in newspapers and mosques.